The Idea of Him, the new novel by the New York Times bestselling author of The Manny, Holly Peterson, will be released on April 1. The Idea of Him is women's fiction about "the dangers of falling for the idea of a person, and why facing reality is more liberating than we ever dreamed it could be" (description from the author's website). 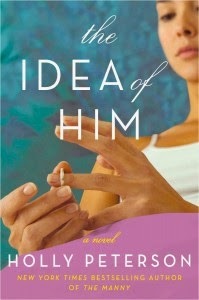 I'm featuring the cover of this book as part of the The Idea of Him Virtual Author book tour. I think it's a pensive and fitting cover. What do you think? Next month, I'll present a guest post by Holly Peterson. It sounds like an interesting novel. Thanks for taking part in the cover reveal! I was just reading an email newsletter about a book You Should Have Known by Jean Hanff Korelitz that is not quite like this book but shares a common theme of how sometimes we fall in love with another person not because of who they are but who we think (or even hope) they are. Hmm not sure about the cover but I do like the sound of the book. The Idea of Him sounds intriguing Suko, I like the cover too. Nice cover! I like the idea of this book and like the title. this is a book I will read FOR SURE. I know very well this kind of situation, unfortunately for me. I wish I had read such a book BEFORE I got involved with said man. I'm going to read it and recommend it on my website,as long as it's good. Unusual book cover but colorful and eye catching. I review the book for the tour too. Hope we like it! Yes, I think the book cover matches the synopsis.